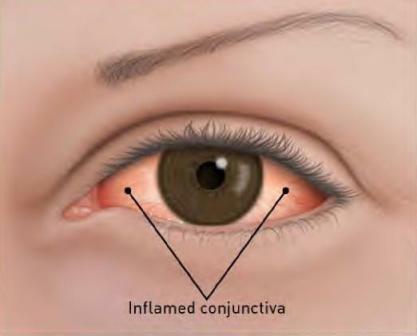 Conjunctivitis is the term used to describe inflam­mation of the conjunctiva — the thin, filmy membrane that covers the inside of your eyelids and the white part of your eye (sclera). Conjunctivitis is most commonly referred to as "pink" eye. The conjunctiva, which contains tiny blood vessels, produces mucus to coat and lubricate the surface of your eye. When the conjunctiva becomes irritated or inflamed, the blood vessels become larger and more prominent, making your eye appear red. Conjunctivitis may occur in one or both eyes. · Crusting of eyelashes in the morning. Viral infection is the most common cause of conjunctivitis. This same virus produces the familiar red and watery eyes, sore throat and runny nose of a common cold. Symptoms of conjunctivitis can last from one to two weeks and then will disappear on their own. Discomfort, however, can be alleviated with warm compresses applied to the eyes. Prescription eyedrops may be prescribed by Dr. Landa to help minimize drainage or discomfort. Bacterial infections, such as Staphylococcus or Streptococcus, cause a type of pink eye that produces considerable amounts of pus. Some bacterial infections, however, are more chronic and may produce little or no discharge except for some mild crusting of the eyelashes in the morning. Antibiotic eyedrops are typically used to treat bacterial conjunctivitis. Infectious conjunctivitis, whether bacterial or viral, is highly contagious while the eyes are draining. Practicing good hygiene can help prevent the spread of conjunctivitis if you are infected. · Properly clean your contact lenses. Allergic conjunctivitis. Allergic conjunctivitis is not infectious or contagious. It occurs when the body is exposed to materials that cause an allergic reaction, such as pollen or dander, and is often seasonal. The main symptom of allergic conjunctivitis is itchiness of the eye. Other symptoms include redness, burning, tearing and puffy eyelids. A variety of eyedrops are very helpful for allergic conjunctivitis. Dr. Landa can help you decide if an over-the-counter or a prescription drop is best for you. Environmental irritants. Irritants, such as smoke or fumes, may also cause conjunctivitis. The symptoms are usually similar to those of allergic conjunctivitis. Generally, conjunctivitis is easily treated. However, if symptoms of conjunctivitis persist for an extended period of time after treatment, you should have your eyes examined by Dr Landa, as these symptoms may indicate a more serious eye problem. There are several eye diseases that cause red eyes, some of which can lead to blindness unless diagnosed and treated. If you are experiencing any symptoms of conjunctivitis, we encourage you to contact us today to schedule a consultation.